Lucas Jordan of the FBI’s Special Crimes Unit is good at finding people. His ability to feel the emotions and especially the fears of victims works as a direct GPS system in tracking down those who are lost. But a recent string of serial kidnapping slash killings has eluded him and the SCU for a couple years now. At least there hadn’t been any leads until it seems that the culprit has finally settled into the small town of Golden, North Carolina. Coming back in contact with Samantha Burke, a fortune teller for a traveling carnival who is also a genuine psychic with precognitive abilities, Luke learns that there is much more to this serial killer than he might have thought at first. Sam confirms that this killer is playing a sick twisted game based on challenging, not simply law enforcement, but specifically Luke who has built a fairly solid reputation for being able to find people who are lost. Having had a vision with dire consequences, Samantha willingly joins the investigation despite the hostility she receives from local law enforcement, in order to help capture this serial killer as well as attempt to keep her vision from coming to pass. In this game that the killer is playing, Luke and Sam must set aside their past conflicts and problems in order to capture this monster before he moves on again and before the stakes become even higher. As like the first six books I have read in the Bishop/SCU series, I really DO enjoy the world and the characters revolving around it. And after the preceding two sub-trilogies, I have a feeling I’ve grown more and more attached to the concepts, the premise, the characters, and the paranormal theories presented in Kay Hooper’s long-running series. In a way, becoming more familiar and more attached to a series’ world and characters and concepts can very easily bias my opinions in favor of each book as it progresses. In other words, if the book is mediocre, but good, I will probably bump the rating up because I enjoyed it so much more than if I’d just learned about the world yesterday. If the book is indeed good on its own merit, I may end up gushing about it to everyone. If one of the books happens to be mediocre and not so good, I’ll give it a pass rather than blowing it off completely. Of course, knowing that this is how my brain works, I try my best to be more objective… sometimes. 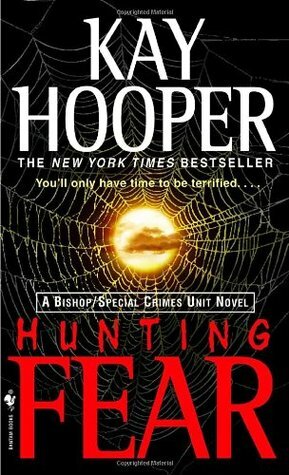 For this particular book, I will admit that I immensely enjoyed Hunting Fear, although there were, obviously, certain issues of the Bishop/SCU logic I questioned, even if half-heartedly. It seems the easiest way to enjoy a book from a series you’re enjoying is to turn your brain off and just think about all the things that you happen to enjoy. And enjoy I did, but mainly because Hunting Fear is probably one of the better of the Bishop/SCU books thus far. And this only slightly has a little to do with influenced bias. I’ve noted that a lot of other reviewers didn’t quite take to Samantha nor Luke, but surprisingly, I really liked their interactions and I especially liked Samantha as well. Strong and capable, she has a snarky personality, but is good-hearted enough not to let her own grudges or resentment or frustrations keep her from helping others. She speaks out for herself when it is necessary rather than letting someone like the police sheriff continue to insult her due to his own personal history of dislike for carnies and fortune tellers. But she doesn’t push back unless she’s forced and simply takes these verbal assaults in stride, knowing that there is nothing she can do to change other people’s minds and knowing that Sheriff Metcalf has his reasons, even if it doesn’t justify his nastiness. While the romance might have been slightly lukewarm and maybe a bit underdeveloped, I DID enjoy the partnership, the bickering, and the chemistry between our romantic main couple. To be totally honest, Luke doesn’t stand out all that much as an individual, and it irked me a little bit that he was the first to take a jab at Samantha and her wacko Madam Zarino fortune telling persona. It was a bad first impression, because as a psychic himself, he should know better than anyone else that it’s already hard for people to take any psychic seriously. Then you learn that Luke knows about Sam’s past and how she ended up working for a carnival in the first place, and then you feel even more irritated that he’d unhesitatingly thrown the first verbal insult before anything else had been said. There was no need to fan flames like that just because he’s got his own issues. His little dickhead greeting was uncalled for. Of course, I give him credit for at least vouching for Sam’s genuine psychic abilities and maintaining that stance. Otherwise, that’s pretty much it for him. As per usual, side and minor characters present were very relatable and likeable. Even the pessimistic and antagonistic Sheriff Metcalf grows on you despite his continued nastiness towards Samantha and his prejudices against carnival folk. You can tell that he’s a good man; he’s just haunted by history, as are many others with their own conflicts and issues. The mystery itself was predictable in its course; and though the identity of the serial killer might have felt like it sort of came out of left field, I wasn’t at all surprised at how everything tied together in the end. Final Thoughts: As per usual, a well-written, entertaining, and page-turning Kay Hooper paranormal mystery and romantic suspense that I found very enjoyable, even if not quite memorable. As it stands, Samantha Burke is one of few characters in the Bishop/SCU world I like a lot. This review was originally posted at Ani's Book Abyss / BookLikes in March 2015. First Impressions and Halloween Bingo!